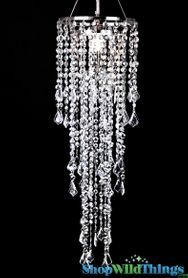 This amazing chandelier set is HUGE and can be used different ways for different applications! 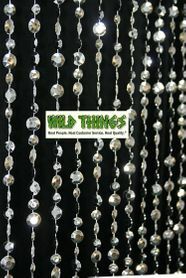 Our bright silver "diamante duo" faceted bead is used for this chandelier set. These beads are the same exact bead as our items that use a bead called "diamonds" but there are two LARGER sizes of beads used for the "diamante duo": 3/4" and 1/2" beads are used in a pattern (large, small, large, small). Now there are several things going on here: you get TWO chandeliers with the order of this set. To make the LARGEST chandelier, you hook the thinner chandelier into the center of the wider chandelier. The resulting chandelier is a 5-tiered item that will fill up an enormous amount of space for you! 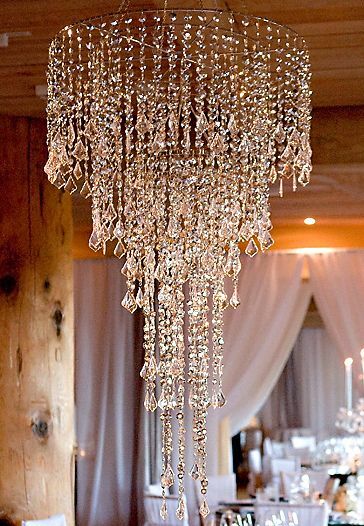 You can also use the chandeliers on their own, and they look fantastic that way too. This is a chandelier decoration and does not come with Light Cord Kits but they are designed to hold one. The center of each chandelier already has the hardware needed to hold a light kit in place. Two light kits (sold separately) will be needed for this chandelier. These are beautiful with or without the light kits, using them is optional. Below the Delight Chandelier (the narrower chandelier in this set)is cleverly used on the tabletop. This is pretty and a lot of fun to look at...I like that it reflects whatever color is around it. I do wish the beads were more high quality, they are a very light weight plastic with a silver coating. I think the silver makes them a little less cheap looking than the clear beads of this type. The flaw that I found was that to hook the two sections together there needs to be a bar across the center opening, otherwise, the middle will hang off-center. I took a strong piece of wire and hooked it across the center hole and suspended the second chandelier from that. All-in-all, it does give a "wow" sparkly effect. Purchased this chandelier for an event. It was much larger than I thought. Love it! I plan on buying a few more!! Absolutely beautiful. Can't wait to use it for my daughter's wedding! ProsIt is large enough to be seen above a dance floor. The clear crystals hanging from the silver strands adds a special touch.